Babies are fragile. There is so much in the environment that can harm them. 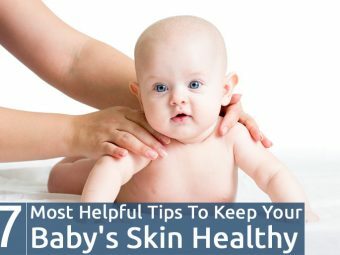 As a parent, your major responsibility is all about keeping your baby healthy. Preventing infections – both big and small – is something all mothers go all out for. But if the enemy is within then what? There are some illnesses that are genetic. No amount of sanitization, washing hands, eating right can prevent these diseases and most do not even have a cure (1). One such genetic disorder is Sickle Cell Anemia. Read on to know more about it. Unlike normal anemia, sickle cell anemia is genetic. 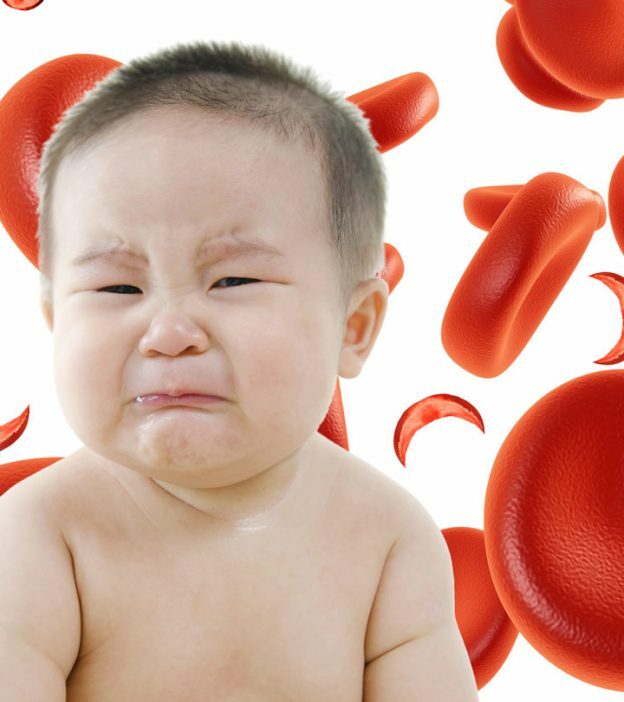 It arises when a baby does not have enough healthy Red Blood Cells (RBCs) by birth. RBCs provide oxygen to the rest of the body. Healthy RBCs are round and can move easily through the bloodstream. But people with sickle cell anemia have RBCs that are rigid, sticky, and have a sickle shape. Sickle anemia slows down or even blocks the flow of blood and oxygen in the body. Sickle cell anemia is a result of gene mutation and passes on from one generation to another. Ethnicity too plays a part when it comes to sickle cell anemia. Hispanic and Caucasian women are least likely to have this disease while black women are most likely to pass on sickle cell anemia to their babies (2). As the name suggests, the blood disorder leaves the body without adequate red blood cells, making it anemic. Pain called crises, is a major red flag for sickle cell anemia. The pain occurs when the sickle-shaped RBCs block blood flow. The pain may fluctuate from a mild one that lasts for a few hours to a severe one that can continue for weeks and demand hospitalization. Tobacco smoke can increase the intensity and frequency of these ‘crises’ by as much as 90% (3). Does your baby have swollen feet and hands? Get her checked for sickle cell anemia. 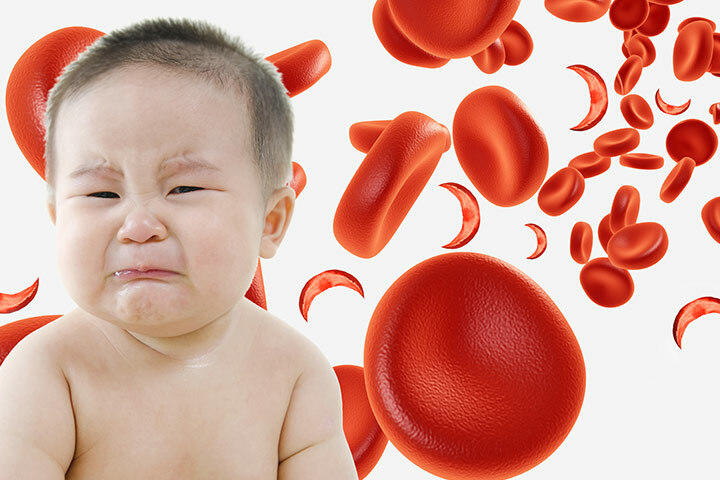 In most cases, it is the first symptom of sickle cell anemia in babies. If your baby is suffering from recurring infections, it may be because of sickle cell anemia. Sometimes, these infections prove fatal too. Without adequate RBCs in the body, your baby will not get the nutrients she needs to grow. That is why babies with this disease report delayed growth. If a baby has sickle cell anemia, chances are high that she might also suffer from sleep apnea (4). A bone marrow transplant is the only possible cure for the disease. However, it can prove fatal for babies. Antibiotics: Antibiotics like penicillin help in treating and preventing the recurring infections. Your baby can take this medication when she is as young as two months old. Pain Relievers: Pain is another common symptom of the disease. Your doctor may prescribe medication that can help alleviate pain and provide your baby some comfort. Hydroxyurea: It is a medication that was earlier used to treat adults only. But recent studies show that the medication can be used to treat babies too (5). If your child has sickle cell anemia, you need to be doubly sure that she is up to date with her vaccinations. A new guideline by the Centers for Disease Control (CDC), recommends a special vaccine to protect against bacterial meningitis for infants with sickle cell anemia (6). Some babies have a higher risk of stroke due to anemia. For such children, doctors may advise a blood transfusion. However, too many transfusions can lead to excess iron in the body, which can damage organs like the heart and the liver. A damaged spleen can leave the body vulnerable to infections. In such cases, the doctor may suggest a surgery to remove it. An operation may help correct vision problems, a common sickle cell anemia symptom. You should breastfeed your baby until she is six months old. After that, give her a balanced and nutritious diet. Iron supplements do not work for babies with sickle cell anemia. So, talk to your doctor before you start your baby on health supplements (7). Keep your baby away from extreme temperatures as they can increase the risk of a sickle cell crisis (8). Don’t use OTC medications without consulting your doctor. If you are flying with your baby with sickle cell disease, make sure to do so in airplanes with pressurized cabins. Unpressurized aircraft cabins can trigger a sickle crisis (9). Avoid traveling to high altitudes with your baby. If you must, talk to your doctor before you plan such a trip. High altitude areas are low on oxygen, which can aggravate sickle cell anemia symptoms (10). Sickle cell anemia is a scary disease, but it need not limit your baby’s life. With proper treatment and prevention, your baby can go on to enjoy a healthy life. Do not allow a bad draw of luck get you down. You can beat it! If your child is suffering from sickle anemia, please share your list of dos and don’ts with us here. 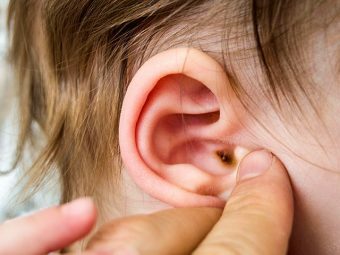 What Causes Earwax in Babies and how to clean it? How To Treat Drool Rash In Babies?